Der Artikel Alfredo Campoli - Milestones of a Legend wurde in den Warenkorb gelegt. Alfredo Campoli – regarded as the »singer« among violinists, as famous for his incomparably beautiful silver tone as for his technically brilliant interpretations. He himself said: »From the beginning I have been taught to play bel canto on the violin.« In the 1950s, his world career began as a classical violinist, having been a sought after entertainer with his »Salonorchester« before the war. 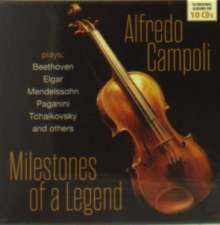 This compilation of 14 original albums from the years 1949 to 1962 contains outstanding recordings of concerts by Beethoven, Mendelssohn, Bruch, Paganini, Tchaikovsky, as well as the violin concerto dedicated to Campoli by Bliss. In addition there are orchestral pieces such as Lalo's »Sinfonie espagnole«, »Gypsy Airs (Zigeunerweisen)« by Sarasate, Wieniawski's »Legends« or »Capriccioso« and »Havanaise« by Saint-Saens. Chamber music works by Paganini, Handel, Bach, Kreisler and Corelli round off this discographic treasure trove. In addition, this box contains exquisite bonus recordings, such as Paganini's »Concerto in One Movement« as well as the indispensable »Devil's Trill Sonata« by Tartini in a recording from 1946.